We throw that word around a lot, don't we? I think it our consumer-driven culture it is so easy to get caught up in getting the next best thing, having more, living well, and taking the easy way. 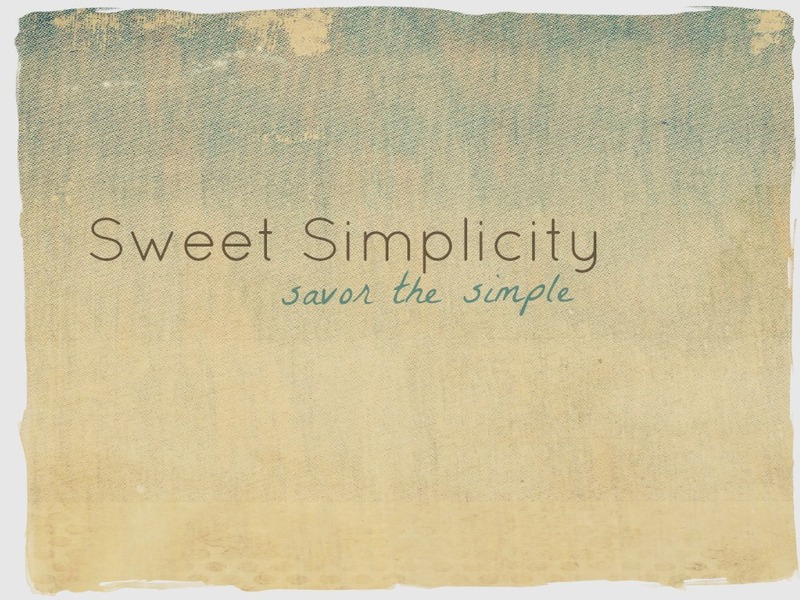 Sometimes using the word "simplicity" is code for stop--let it be simple. We desire it. We crave simplicity in our complicated word. Well, at least I do. Lately, I've been thinking about what having a simple life means. Honestly, sometimes when I read about people making bread from scratch and calling it simple, I think..."isn't that more complicated than buying it at the store?" Yet, the other part of me argues that it's not the process that is simple, but the outcome. So, my brain battles: Which is it? The process or the outcome? Perhaps both. The dictionary describes simplicity with these words: freedom from complexity, easy to understand, absence of luxury, having naturalness and sincerity, and being simple. For me, simplicity is striving to live a life that is satisfied with the beauty of the everyday, living contentedly with what I have, and enjoying the simple things in life. It doesn't mean that complicated matters don't enter my life or that I never get caught up in all the fuss. Believe me, they often arise! But, even though I sometimes I want a closet full of awesome clothes and outfits for every occasion, I choose to have a closet that is filled with simple items that work. Just like having a simple wardrobe leaves breathing room in my closet, choosing simple things and processes breaths space into my world. For example, I love to bake and cook. Even though I love to add a complicated and intricate recipe into the mix every once in a while, I typically cook and bake simple things. I like recipes with ingredients I recognize. I appreciate recipes without lots of fuss. Plus, when I choose simple recipes, I usually end up spending less money, less time cooking/baking, and less time cleaning up. This gives me breathing room for my budget and time. Simplicity breaths life and space. Originally, I wanted to join the Nester for her 31 Days series and write all about simplicity. But, October is looking like a crazy month! Plus, I've got lots of things in the works over here, and I decided that I couldn't shave out all the time I needed to do it. Instead, I'm going to start a series (I'm not sure if it will be weekly or consistent at all) about simplicity. It will be a series that includes simple recipes, simple projects, simple decor, how to simplify, etc. Come back tomorrow for the first installment!